The Visitor and Art Trail Center is open weekends May-Columbus Day 10 a.m. - 4 p.m. and Monday, Wednesday and Friday afternoons 1-4 p.m. April-November. We are closed December-March. Please call 518-589-6657 to be sure someone is there when you arrive. The Railroad Station is open by request and we are happy to accommodate group visits if you call ahead. If we are closed, please take a brochure from the Information Booth and enjoy your self-guided tour around the campus. The Mountain Top Historical Society is located in Haines Falls on Route 23A in Greene County, NY along one of New York State’s most beautiful scenic byways. The 20-acre campus sits at the top of Kaaterskill Clove, the site of New York State’s second-highest waterfall. The beauty of the clove and waterfall drew artists and writers of the 19th century, launched the Hudson River School of art and today, continues to draw thousands of visitors every year. From the North — Exit 21, I-87, NYS Thruway. Make left onto Rt. 23B, continue toward Catskill and take ramp on right to Route 9W south, at the fourth traffic light go straight onto Route 23A toward Palenville. After the light in Palenville, travel 4.5 miles to reach MTHS Campus and Art Trail Interpretive Center on the right. From the South— Exit 20, I-87, NYS Thruway. Left at exit , then right onto NY32. Bear left at NY 32A (blinking light) then left onto NY 23A at the light in Palenville. Travel 4.5 miles to the MTHS Campus and Art Trail Center on the right. 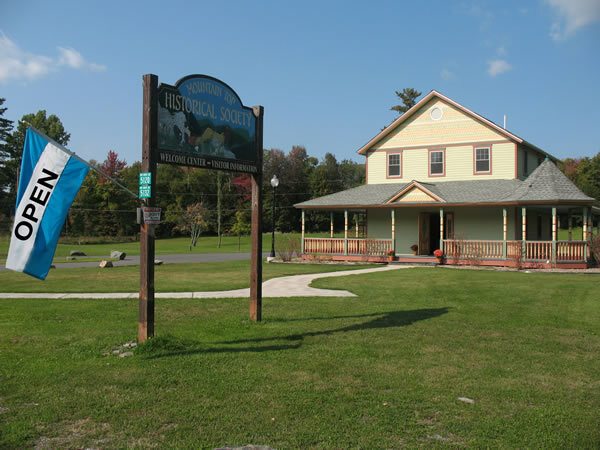 Situated directly on Route 23A, this building serves as MTHS’ headquarters, provides visitor information and houses the Hudson River School Art Trail Interpretive Panels. The panels help visitors understand how nature and many painting sites still accessible today inspired the 19th century Hudson River School artists. Built in 1913 at the end of the era when 20 million vacationers visited the Mountain Top. 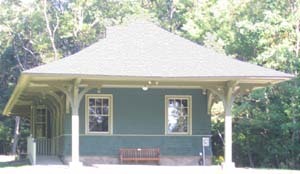 Out of 25 rail stations once found in the county, this is the only restored station. The building cannot be seen from Route 23A. Follow the asphalt road from the Visitor Center parking lot, past the outbuilding and make a right at the intersection of the three roads. Once used as horse barn, now used seasonally for art shows and exhibits. 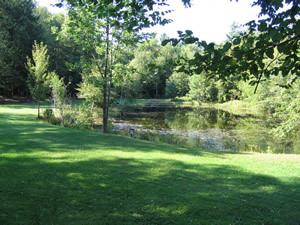 Located at the rear of the property on the northwest side of the campus, behind a grove of trees. Follow the asphalt road from the Visitor Center parking lot, past the outbuilding and go straight at the intersection of the three roads. 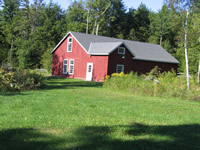 A calm and tranquil place to walk, located near the Red Barn on the northwest edge of the campus. Follow the asphalt road from the Visitor Center parking lot, past the outbuilding and go left at the intersection of the three roads.